What makes Bali so appealing as a destination is the broad range of experiences on offer. The beaches are the main appeal for most, and there are a wide variety to choose from, depending on the activities you're interested in and your desire for privacy. However, in addition to the beaches there are the cultural centers and pastoral beauty of the volcanic mountains. This makes Bali an ideal destination for those that want a little more than just a beach holiday, but don't want to spend a lot of time (and money) moving around. None of the beach resorts is more than a couple hours' drive from the mountains, so you can get around easily, without wasting hours in an airport. You'll find hotels and resorts all around the island, but the highest concentration is in South Bali, which itself consists of several distinctly different areas. Most people come to Bali for the beautiful beaches as well as the fascinating culture. If your visit to Bali is more than a few days (and your first visit should be) then you'll want to split your time between at least two places, such as the beach and the cultural center of Ubud. Many people with a full two weeks or so available choose to spend a few days on one beach, followed by several days in Ubud, and ending with some more beach time in another location. Or, those wanting to see more of the country take a side trip to one of the other popular destinations of Indonesia, such as Yokyakarta to see Borobodur; Tana Toraja or Komodo. Picking the "right" beach for you can be a challenge. If you want to be right in the middle of it all and nightlife is an absolute must, then the Kuta / Legian area is for you. This is also the place to be if you want to surf, or learn how. If you want a nice beach near the nightlife but not in the middle of it, then you may want to consider Seminyak, which also has a high concentration of good restaurants. Sanur is the place to look at if you'd rather have a good beach for sunbathing and an ocean good for swimming, and aren't really interested in nightlife beyond a good restaurant. For true isolation, consider Candi Dasa or the black sand beaches of Lovina on the north shore. 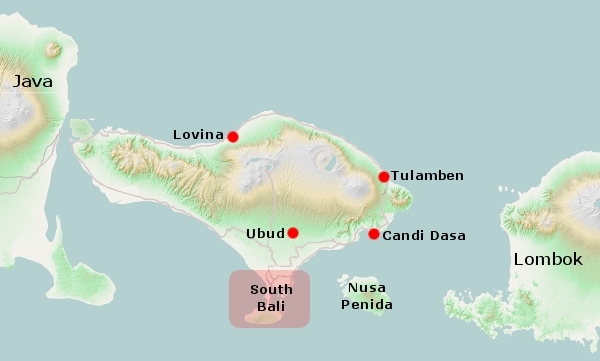 Scuba divers tend to stay either at the western end of the north shore, or near the eastern tip around Tulamben and Amed. To find out more about the scuba diving opportunities around Bali, see our companion guide SEA Undersea. Inland towards the center of the island is the "cultural capital" of Ubud. Highly developed in recent years, Ubud is nothing close to the "real Bali" that it was reputed to be. Today, it has the flavor of an artists' colony with the added bonus of some great natural attractions. Ubud is a great place to kick back, relax and spend a few days -- or a few weeks -- exploring galleries, nature and other attractions. Located on the far north coast of Bali, far away from the other island resorts. Lovina supposedly means "I love Indonesia" and refers to a stretch of black sand beaches west of the old island capital of Singaraja. There are several hotels here, and the area can make a good base for exploring the north coast. This one-time small fishing village on the central east coast was destined to be the new resort area. However, the beach was quickly eroded due to the destruction of the protecting reef, so now much of the area is left without any suitable beaches. There still remains several good resorts that can make for a pleasantly quiet holiday and the region as a whole is a big draw for scuba divers.